October | 2013 | Syed Jahanzaib Personal Blog to Share Knowledge ! 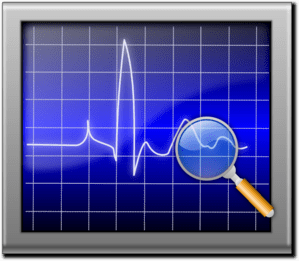 Following post is about how to monitor Mikrotik System / Routerboard to create live graphs with history for every aspect, like CPU, Memory, Voltage, Amps, Interface etc. It comes very useful when you remotely administrating the system and you need to know what happens over the period of time and have an overview on every internal instance of the system. I wrote another article that explains well on howto install MRTG in Ubuntu and monitor anything with it, but WORDPRESS coding ruins the code badly, but still you can get idea from it from following URL. First Enable SNMP service (with public as community string or whatever you like on your mikrotik. Make sure no firewall rule is blocking SNMP traffic from/to the monitoring server. First you have to check your simple queue OID (numeric value which is used by MRTG to poll specific data from the remote server) in mikrotik. 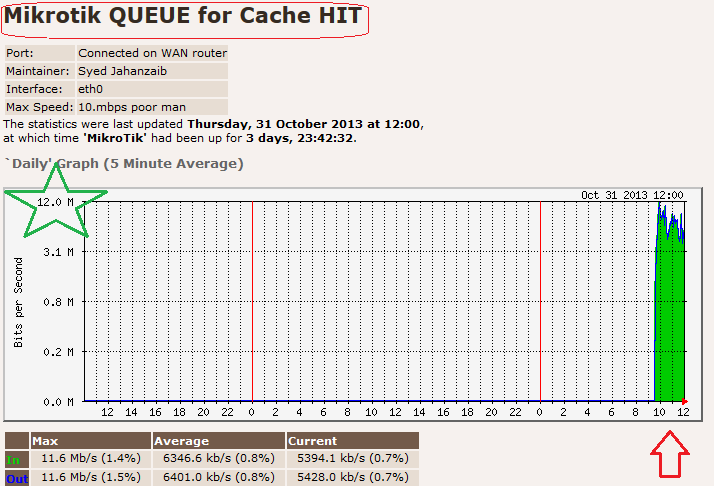 for example you have a queue to allow 100M for proxy cached marked packets. Now check its OID value which will be used in MRTG to graph the values. Do remember, If you move/delete/add particular Queue , the oid value will change, simply note down new value and recreate graphs with the new values. Also on every system these OIDs are different, simply take a print oid to use them. Now you can simply use the below CFG file to create Graphs for the mikrotik simple queue. 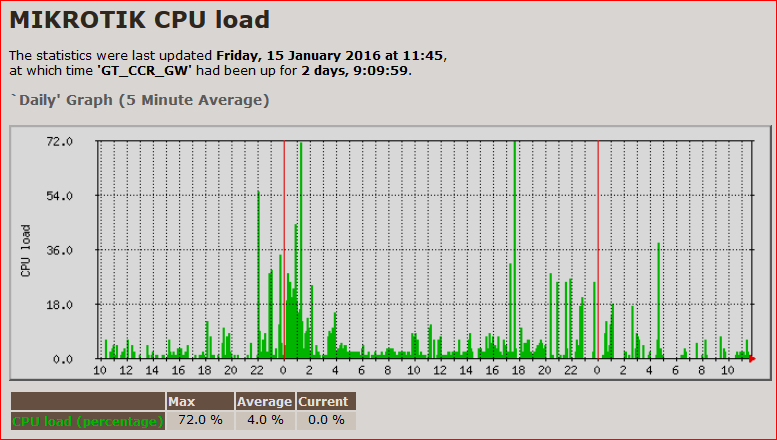 Following are sample graphs showing various aspects of Mikrotik CCR 1036. SAMPLE CFG FILES (WORKING GOOD WITH MIKROTIK CCR_1036 ROUTERBOARD MODEL. Finally DMA has released its new version for Radius Manager Billing System. Complete info can be found here. UNSTABLE / INCOMPLETE guide dueto time shortage. The aim of writing this basic howto is to find methods in SQUID to inspect SSL / HTTPS traffic at very minimum level. In this method, The SQUID will act as a MITM (man in the middle). The aim behind doing this config is to decrypt HTTPS connections to apply content filtering which is usually not possible with traditional http methods. Also note that https caching is not recommended , at the date of writing this (January 2014) still, I haven’t found any 100% working method to bypass certificate issues. The only way is to IMPORT certificate to user browser. Importing is OK for a small network, like cyber/net Cafe or Office, Where you have FULL/PARTIAL CONTROL over user PC, but its not suitable for large network or where you cannot convince ppl to trust the new cert. Also if you are ripping SSL traffic, You’re exposing yourself to potential lawsuits for doing ripping user private stuff and possible hacking purposes. IMPO, This approach is OK for content filtering purposes or for government surveillance or only according to law . There are methods to bypass CERTIFICATE mismatching and via using iptables nat, you can do transparent redirection of 443 to your proxy. Now create temporary directory where we will download squid source packages for compilation. Paste Following SAMPLE config file. acl vc_url url_regex -i \.(youtube|youtube-nocookie)\.com\/(videoplayback|get_video|watch|watch_popup|user_watch)\? 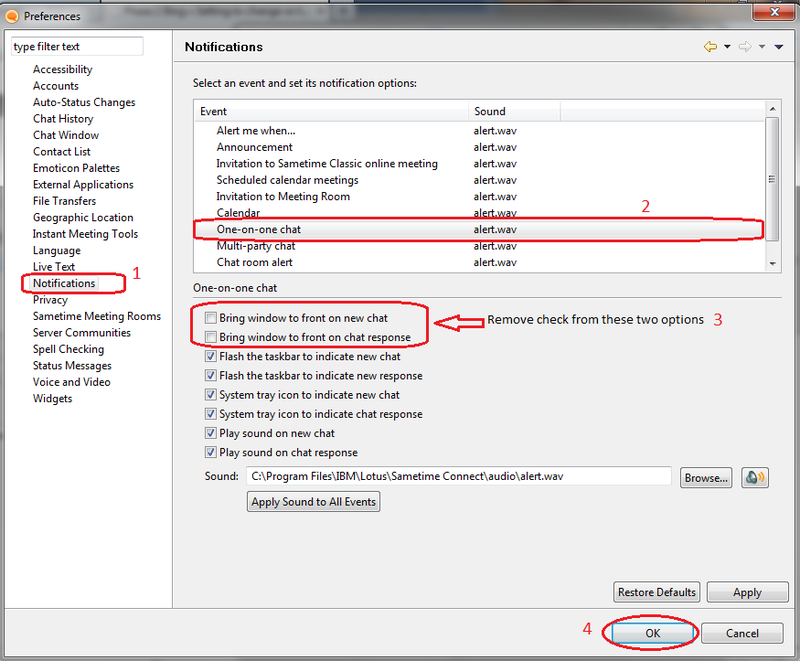 Create cache folder and assign necnessary permissions. Now start SQUID in no daemon mode to verify you dont have any errors in the config file. To redirect TRANSPARENTLY port 80 and 443 to local proxy. change the eth0 to match your local LAN interface. 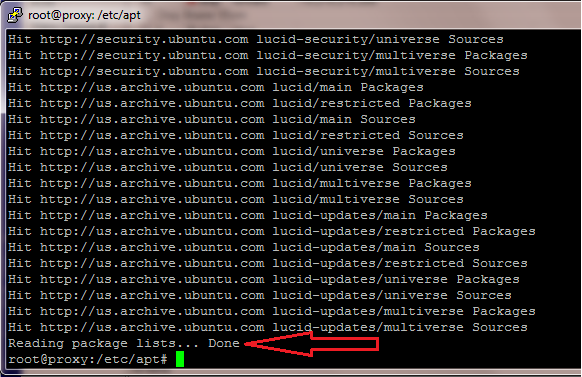 If you are having trouble using apt-get in Ubuntu 12.4 As showed in the image below . . . 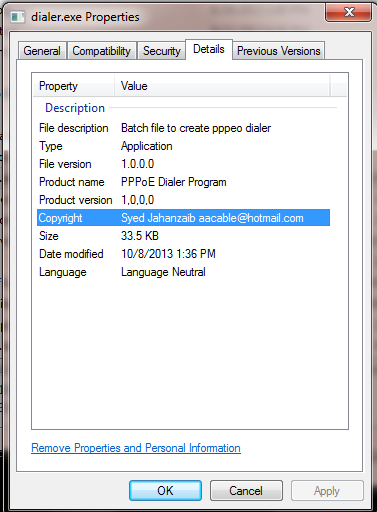 Following is a simple and quickest method to create pppoe dialer using MSDOS batch file made for Windows 7, which create a new rasphone profile for PPPoE Dialer. Usually this sort of work is done using VB , or VB/VC# .NET with Dotras type programming languages which does the job nicely with lots of options and fancy look menus etc, but due to my limited knowledge towards programming, I decided to go with my traditional CLI method. I created this batch program in a very short time without much googling. This is just an example, you can modify at as per your requirements , The issue i faced while adding multiple lines was white space at the end, and if there are additional white spaces in the file , rasphone will not detect the new entry. therefore I later used algorithm to remove white spaces. Any suggestion to improve the method will be highly appreciable . . . Please psot your comment if this batch file is working ok for you . . . Paste following data and save. Now execute it from c:\dialer.bat & then restart your computer. If you dont want to restart the newly created connection will not show in network connections, You have to press F5 in the network connections to display the newly created profile. After restart it will appear auto in network and sharing center. After successful lab testing, its time to make it a distributable package. 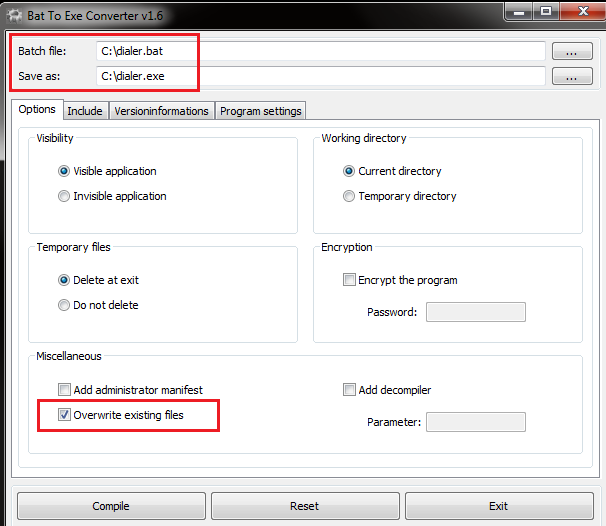 To convert it in executable package, you download BATCH to EXE converter. 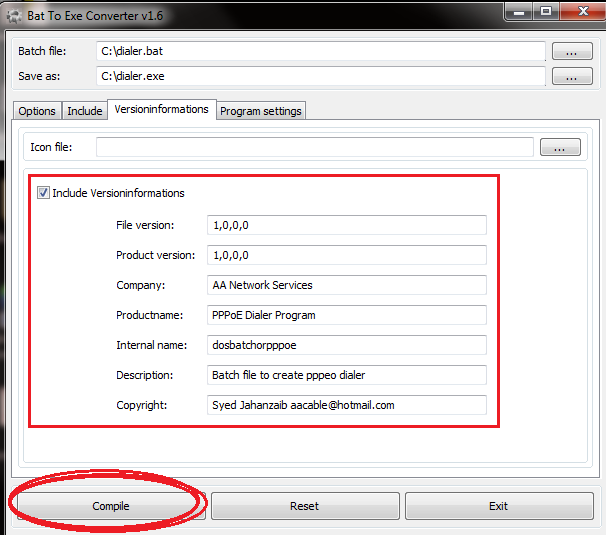 Fill up the required info as shown in teh images below and click on compile. As showed in the image below . .